You are not required to purchase any study materials to take our recertification. We make these products available for your convenience. At $12 each, AMRI’s ACLS and PALS certification pins are an affordable way to add a professional and distinctive flair to your daily work attire. The AMRI Certificate adds distinction to your wall for just $12. 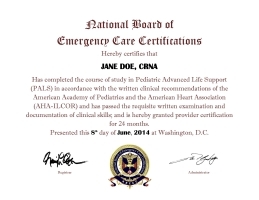 Includes your name, date of certification and the official seal of the National Board of Emergency Care Certifications. Full Color Paperback, 288 pages, Printed November 2015. Must-have for medical professionals in emergency, intensive care and critical care areas. Includes the most current 2015 guidelines. Full Color Pocket-Sized Spiral-bound, 216 pages, Printed November 2015. Must-have for medical professionals in emergency, intensive care and critical care areas. Includes the most current 2015 guidelines, s tep-by-step guide, checklists, easy-to-use algorithm and drug treatment information. Full Color Paperback, 190 pages, Printed March 2016. 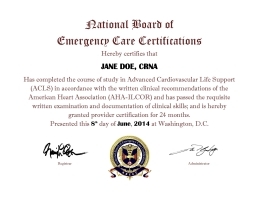 Must-have for ACLS recertification students. Includes the most current 2015 Guidelines. Full Color Paperback, 352 pages, Printed October 2016. Must-have for PALS recertification students. Includes the most current 2015 Guidelines.